I've finished painting up the Mechanical Rider for Malifaux. This is the new multi-part plastic model from Wyrd Miniatures. In this post I will share a lot of pictures of the finished model and discuss some of the techniques I used to paint it. I'll also share an embarrassing story about painting female models. Click on for more pictures! This model sat as a work in progress for several months. I airbrushed the base colour of the metal. I had some problems with the spray pattern on the metal. I was a bit frustrated and put off finishing the model for several months. I often have a little crisis of confidence when a model is half painted. Things like the glossy finish before varnishing tends to make the model looks worse than the final model. Once I fully paint one area (on this model it was the mane, often it is the skin) I usually feel better about a model and can power through to finish it. This model was fun to assemble and paint. The plastic model assembled pretty well. I left the rider and horse separate to paint and then glued them once they were almost finished. The only gap was on the piece covering the "eye" area on the horse. Some liquid greenstuff fixed it easily. 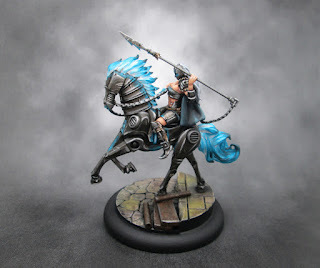 I used Vallejo Game Colour Falcon Turquoise to paint the mane. I mixed in white for the light areas and P3 Coal Black for the dark areas. I used P3 Coal Black and white to highlight the cloak. Coal Black is a great colour. It blends really nicely and makes a nice and vibrant highlight for black areas. This is the first time I have done this much OSL on a model. I tried to emphasize who bright and unnatural the lights are on this model but tried not to go too overboard with the lighted areas. This model (and it's exposed cleavage) made me think of one of my most embarrassing miniature painting experiences. When I was 12 or 13 I painted a Bretonnian Sorceress with a low cut robe. I painted some shading in the cleavage. My Dad thought this was hilarious and showed all of his friends when they came over. I later went back and painted over the shadows with flat paint. To this day, I feel guilty and embarrassed about highlight cleavage... It's pretty funny now. I'm hoping that this model will be good for putting down more Scheme Markers in Malifaux. My Ramos crew is a bit slow. Hopefully the Mechanical Rider allows me to put down distant scheme markers faster. At the very least, it should look impressive and eye catching on the tabletop! As always, thanks for visiting. 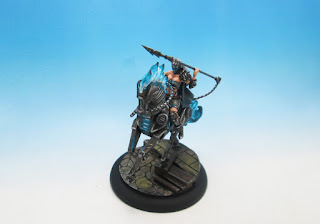 I'd love to hear your constructive criticism and thoughts on this model and how to use it in games of Malifaux. Be sure to visit again in the next few days for the stunning conclusion to the Firestorm Caen campaign. Nah mate. Looks bloody good. The osl is not over the top and I like it more for it. When are we going to get some sort of malifaux aar so you can show us how these mechanical Devils play? Thanks for the kind words, Dai. I'm not feeling confident enough in the game to write an AAR yet. Maybe a tournament report once I play one. So far I just lose all the time. I've posted some game pics on twitter. The game is fun and thematic. The models and terrain look beautiful in games. I like the kinisthetic appeal with the cards too. I'd just like to be half decent at playing the game. It's very much a game of resource management.